A forum for crafters, from card makers, to scrappers to jewellery makers. No it's not a card for the cats birthday (mainly cos his birthday is back in May lol). Card made for the "I Love Promarkers" group challenge on facebook (the one Ruth is on the DT for). 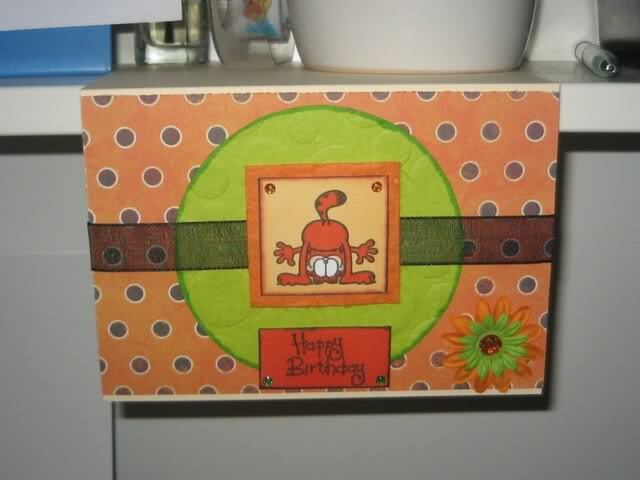 Same idea as my Garfield ATC but bigger! I've found that promarkers are the easiest thing to use to colour in EVER! I thought I did well with my twinkling h2os but even they look like pants next to my colouring in these! Nice job Kate - You can't go wrong with Garfield can you ? I'm also tempted by the Promarkers.